Evfrosinia Kersnovskaya “Truth is like light. Illustrated memoirs of the 40-s and 50-s”. This edition consists of two volumes. The title was taken from the author’s manuscript. Kersnovskaya E. “Truth is like light. Illustrated memoires of the 40-s and 50-s: in two volumes. – Moscow: Nelly Podgorskaya (Meier), 2014: portraits, illustrations (volume 1 – 412 pages, volume 2 – 428 pages). Project conceptualization and management: Igor Chapkivsky, Nelly Podgorskaya. Engrossment, textual links between the albums, routs on the maps – Galina Atmashkina. Foreword – Nikita Alexeev. Afterword – Vitaly Shentalinsky. Design – Konstantin Tchubanov.ough early 1970s, E. Kersnovskaia had created a text-and-picture work about her ordeal in gulags where she had spent the period from early 1940s till late 1950s. The work consists of 12 notebooks that include 2039 notebook sides, some of which have drawings (703 drawings, mixed technique). For security considerations, E. Kersnovskaya made three handwritten copies of the notebooks with full reproduction of drawings and lodged them with various persons. The album version of the work consists of 12 notebooks containing 680 sides. Each side is a drawing with an extended caption accompanying it. They often make parallel between this text-and-picture work and comic book or Russian amature painting. The album version had been created in 1970s. By 1983, E. Kersnovskaya's friends in Moscow made a samizgat type-written version of the work. It consists of six bound volumes. The author made drawings with accompanying captions on some of empty type-written pages. By then, she was 75 years old. E. Kersnovskaia had been always looking for persons she might have logged her work with. And she found them because they, in turn, were looking for the truth about the Gulag. In late 1980s, the Soviet media started printing the stories on Great Terror. It was then when E. Kesnovskaia made I. M. Chapkovsky her copyright holder. When he asked how her work should be published she answered, "As it is," adding, "I trust you." The copyright transfer was valid, and Igor Moiseevich Chapkovsky who had no previous experience with publishing approached various media. The first fragments of the work were published in the Ogonyok magazine (1990, issues 3 and 4) - 64 drawings with captions, and the Znamya journal (1990, issues 3, 4 and 5) - the first third of the text without drawings. The fragment published in the British Observer magazine was accompanied with eight drawings. An important development came in 1991, when the album Naskalnaia Zhivopis' (Cave Painting) containing 350 facsimile drawings and 120 reduced sides with drawings and text fragments was published in Russia and Germany. An important development came in 1991, when the album Naskalnaia Zhivopis' (Cave Painting) containing 350 facsimile drawings and 120 reduced sides with drawings and text fragments was published in Russia and Germany. 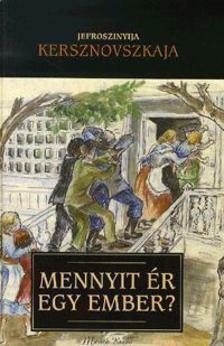 Its German title was "Ach Herr wenn unre Sunden uns verklagen" (Our iniquities, O Jehovah, testify against us). With regards of drawings and accompanying text, the album "Coupable de rien" (Perfectly innocent) prepared with E. Kersnovskaya's participation and published in France in 1994, soon after her death, has been for now the most comprehensive foreign version of her work. In 2000-2001, the full text of the work in six volumes was released under the title What's a Human Being Worth. The only bulk-issue publication (5,000 copies) was illustrated omnibus What's a Human Being Worth (2004) released in "Corpus of Endurance and Transfiguration" series published by the Foundation for social, economic and intellectual programs (Foundation of Filatov). In 2006, the year of Kersnovkaya's centenary, her work was, for the first time, published in full, the text and drawings (notebook version). The 856-page book opens with the foreword by V. Pasat and Eufrosinia's family photo-album. Its appendix contains archive materials (parts of investigatory records and papers on quashing of sentence to E. Kersnovskaya). "Quanto vale un uomo" , BOMPIANI Edition, 2009. Jefrosinia Kiersnowska. ILE WART JEST CZŁOWIEK.– Świat Książki. Warszawa, 2012. Kersnovskaya E. “Truth is like light. Illustrated memoires of the 40-s and 50-s. – Moscow: Nelly Podgorskaya (Meier), 2014: portraits, illustrations (volume 1 – 412 pages, volume 2 – 428 pages). Engrossment, textual links between the albums, routs on the maps – Galina Atmashkina. Foreword – Nikita Alexeev. Afterword – Vitaly Shentalinsky. Design – Konstantin Tchubanov. Kersnovskaya E. What's a Human Being Worth / Eufrosinia Kersnovskaya. - M. : KoLibri, Azbuka-Atticus, 2016. - 800 p. + inserts (32 p.). - ("Biographies, autobiographies, memoirs" series). - Editor-in-Chief Oksana Saburova. This one-volume edition was published almost in full and includes illustration plates with 32 author's drawings created for the book of memoirs, as well as an article titled "About the author" which tells about the fate of E. Kersnovskaya and the history of writing the book. The book can be ordered at "Ozon" online store : www.ozon.ru.